Contrary to the official selling points, the Republican tax reform is not primarily a plan to help the US economy grow. It is equally concerned with maximizing tax revenue; in fact, when the goals of stimulating growth and collecting tax revenue collide, the reform tends to prioritize tax revenue. Its preference for securing tax revenue is so strong, in fact, that it reinforces the progressive profile of the personal income tax code. Under some conditions the Senate version creates marginal-tax effects in excess of 100 percent. With the federal government debt exceeding GDP, it is understandable that congressional Republicans want to get deficits under control. After all, the US government still has not recovered from the credit downgrades it suffered under President Obama’s first term. There is just one problem: it won’t work. Reforming taxes to reduce, or even control, the budget deficit is like a cat trying to catch its own tail. Deficit reduction will require major, structural spending reform, an item that is notably absent from the GOP legislative agenda. This was the first tax reform in U.S. history that put upfront revenue enhancement on par with a long-term goal to grow the economy. The reason is painfully simple: over the past half century, the American welfare state has been notoriously, chronically, structurally under-funded. With deficits now being a permanent, third arm of government funding (in addition to taxes and fees) we continuously push part of the cost for our economic redistribution onto the shoulders of coming generations. Yet the solution - to try and preserve or even enhance the upfront tax revenue stream while encouraging economic growth - is little more than an exercise in macroeconomic schizophrenia. Upfront revenue, i.e., tax revenue that we can reasonably expect in the next couple of years, are determined almost entirely by current growth and tax rates. The growth in rate needed to grow tax revenue takes a couple of years to kick in; the Reagan and Bush tax cuts generated more revenue only after a full two-year multiplier cycle had gone into effect. In fact, the reforms did not "pay" for themselves revenue-wise until later than that. Reagan's reforms, enacted in the early 1980s, showed their prowess in paying for government in his second term. Bush's reforms had similarly delayed effects. The revenue boost was there, and there is no doubt that it was generated by a significant increase in GDP growth, but it did not happen overnight. In both tax reforms, the key to a growth boost was a substantial reduction in taxes. Focus was exclusively on tax cuts. In the Trump reform, the unwavering focus on cuts was reserved for the corporate side; on the personal-income side, however, the reform reshuffled the tax burden more than anything else. The responsibility for paying personal income taxes - which generate 80 percent of all federal tax revenue - is now going to be concentrated onto even fewer shoulders. It is here, in the redistribution of the tax burden, that we find the schizophrenic design of the tax reform. In order to generate growth, a tax reform must reduce the tax burden for all income earners; when only low-income earners get a tax cut, the growth effects of the tax cut are locked in. As the economy grows and demand increases for labor, the limitation of tax cuts to low incomes gets in the way of a rise in higher-qualified labor supply. The marginal thresholds in the tax code have increased, raising the price tag for those seeking to further their skills, take on more responsibilities and advance their careers. This cuts short the growth effects of the tax reform. But it may not even come to that: by not cutting taxes for higher incomes, the tax reform does not put more money in the pockets of higher earners. Therefore, there is no boost in private consumption among those with higher incomes. The economy loses out on a growth-generating stimulus effect. In the particular case with the Trump tax reform, the corporate-rate cut and the one-time 15-percent rate on the repatriation of overseas assets may be enough to compensate for the lack of growth stimulus on the personal-income side. I doubt it, though: we have a large, untapped supply of labor in all those who gave up on finding a job under the tepid-growth Obama years. Under this reform, they may be encouraged to come back and work again, but only at the lower end of the labor market. The higher we go on the professional ladder, the less we benefit. To put a number on this problem: it is highly unlikely that we can sustain three percent growth over more than two years thanks to this reform. The boost that capital repatriation and a lower corporate income tax will generate, will very likely last longer than two years, but not at any impressive rates. At the end of the day, production capacity - which is what investments create - needs an economy to absorb its production; until U.S. consumers overall experience a noticeable rise in their take-home earnings, there will be no significant boost in absorption (consumption) here in the United States. A half-percent higher growth rate over time is realistic. That, however, is far from enough to close the deficit in the federal budget. Which brings us back to macroeconomic schizophrenia. The reason why there is no cut in taxes for higher personal incomes is that Congress wants to retain as much upfront tax revenue as possible. In doing so, as we have just seen, they stifle growth. This is inevitable: you cannot prioritize the collection of tax revenue and pursue economic growth at the same time. There is, however, an underlying factor behind the tax reform that nobody has spoken of (with the exception of yours truly, as the above quote suggests). The reform is predicated on the preservation of the American welfare state. When Congress wants to secure upfront tax revenue, it prioritizes raking in money over reforming spending; when upfront revenue is equally important as economic growth, the underlying motive is the very same notion: no deficit-reduction efforts on the spending side. This fear of reforming the welfare state was actually the reason why we got the Reagan and Bush reforms in the first place. Both reforms substantially boosted tax revenue and allowed Congress to continue to maintain the welfare state. If we assume that the deficits we have seen since the 1980s are in some way fiscally acceptable - at least short term - it is fair to say that the Reagan and Bush reforms extended the fiscal life of the welfare state by about 20 years. With the Trump reform, that era has ended. Fear over the federal debt is now at a level where it is leading legislators to prioritize revenue collection over growth. Yet the very reason why the welfare state is fiscally unsustainable is that it actually depresses economic growth. Figure 1 helps us understand this point. As I explained in my latest book The Rise of Big Government: How Egalitarianism Conquered America, the War on Poverty, which started in 1964, morphed the American welfare state into a completely new entity. What had originally been a socially conservative welfare state - with little sprinkles of egalitarianism during the FDR era - became a completely new animal under President Lyndon Johnson. The goal was no longer to relieve poverty, but to redistribute income and consumption between citizens. 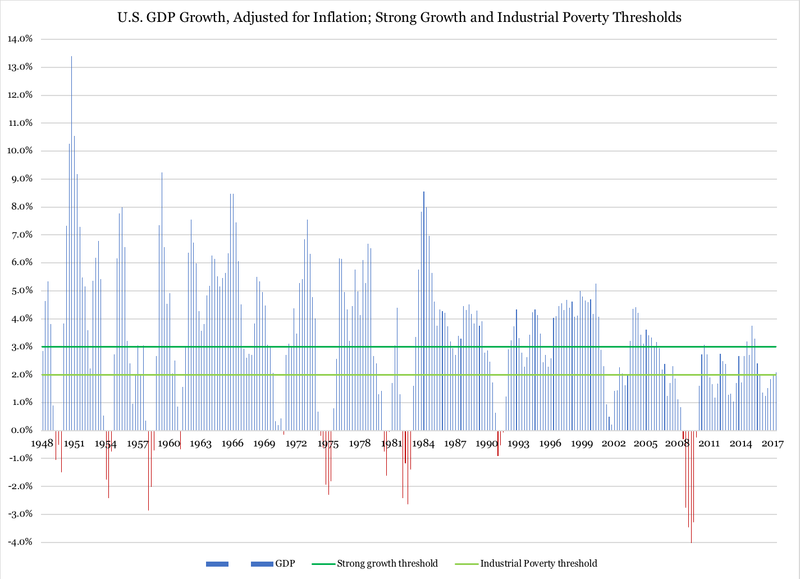 Before the War on Poverty began, and about a decade into it, the growth periods of the U.S. business cycle typically topped out with growth spurts substantially above four percent. Once the War on Poverty had gone into full effect, and Congress had redesigned the tax code so that they thought they would be able to pay for it, growth slowed down. 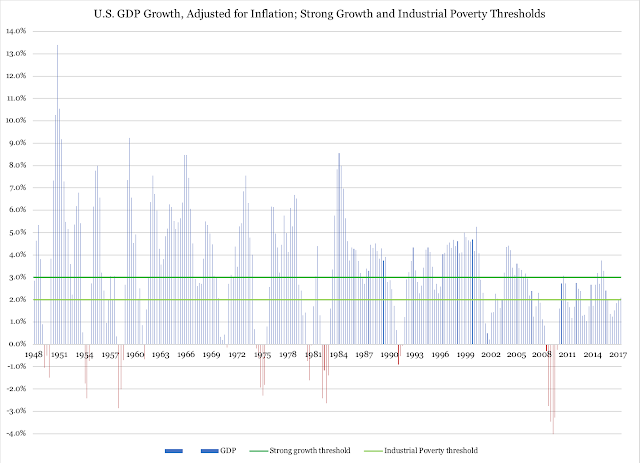 Through the 1990s, the economy could no longer sustain four percent growth other than for short periods of time (the longest being President Clinton's second term). The welfare state had begun taking its toll on the economy. As it continued to grow - welfare reform slowed the increase in welfare-state spending while Medicaid for Kids, i.e., SCHIP, substantially expanded Medicaid spending - it disincentivized workforce participation, career advancement and productive investments in small businesses. On the tax side, the personal-income code was still relatively lenient, though the marginal-tax effect was somewhat sharpened under Clinton. However, after the Millennium Recession growth slowed again; three percent GDP growth was now a rare sight in the national accounts data. A lot of economists - and others - will object to the conclusion that this long-term decline in growth originates in the welfare state. I don't take objections from economists/econometricians very seriously (their understanding for cause, effect, theory and policy is typically shaped by what fits inside a multivariate regression) but political economists, public policy generalists and other solid social scientists often make good points. 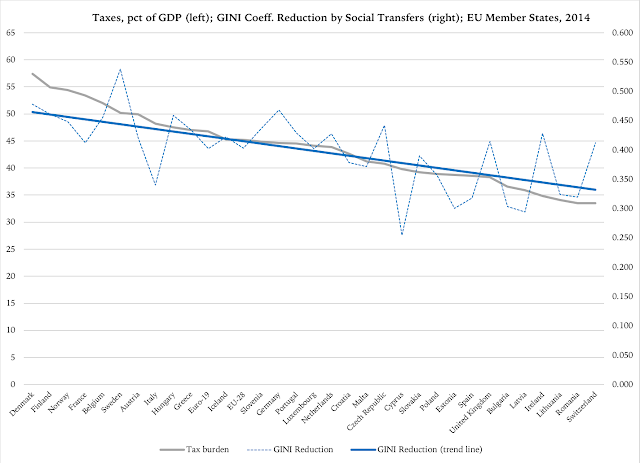 Therefore, in anticipation of their objections, let us take a look at some data from the one place in the known universe where the welfare state has really made a difference: Europe. Even if we take into account the insufficient supply of data from the OECD - 35 countries and a discrete choice of years - it is still quite clear that GDP growth and social expenditures correlate negatively. In other words, the welfare state weighs down the economy, slows down growth and therefore undermines the economy's ability to fund that very same welfare state. Figure 3 reinforces the point that egalitarian welfare-state ambitions necessarily lead to high taxes. 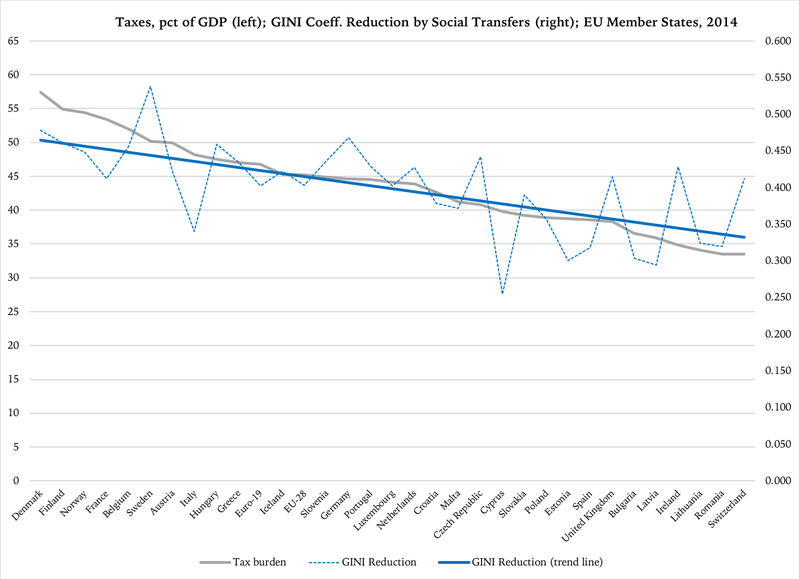 It reports data on how much social transfers (a specific term for social expenditures; the distinction is essentially theoretical) levels out income distribution, i.e., lowers the GINI coefficient. The right-hand vertical axis reports by how much - what GINI value - the coefficient has been reduced. 1. An ambitious welfare state that wants a lot of income redistribution is going to have high taxes. 2. 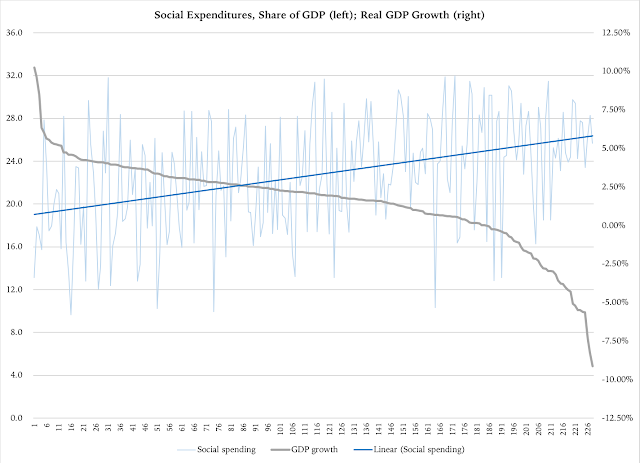 An ambitious welfare state is going to have big social expenditures as share of GDP. 3. High taxes depress economic growth. 4. In other words, over time the welfare state leads to a permanent decline in economic growth. The only way to permanently solve the growth problem is to permanently reform away the egalitarian welfare state. It can be done. All it takes is courage.